With the release of any new Apple product you can only expect to see a flood of new accessories on the market. With the iPad, Apple seems to have lifted the accessories market to new heights. The selection of iPad cases, iPad sleeves, iPad docks, and iPad stands is overwhelming. Most people already have a bag to carry around their sleek new friend in, and a lot of people wouldn't dare to sully the sleek metal case with some neoprene or silicone cover-up. I have a feeling that iPad stands will probably be the biggest piece of the iPad stand pie. If you have an extremely keen eye for design and demand that all your accessories fit your product like a glove you can find some nice options for $49.99 or even $129.00 but if you are like the rest of us and your iPad purchase has forced you to limit your food choices to Ramen or Toast you are probably going to want a stand that's a little more economical. The Fellowes Study Stand was designed to hold books and magazines upright at an ideal angle for hands-free reading. This ideal angle for reading is coicendally also the ideal angle for watching movies or viewing a slide show. You can get them at such a great price you'll probably want to buy one for the kitchen, one for the office, one for the living-room and one to keep at the in-laws. 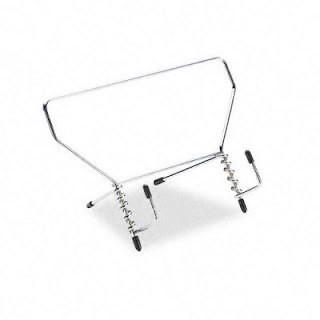 This alternative iPad stand is made from a heavy duty wire that is plated with chrome. It has some rubber stoppers on the ends to help to keep things in place. You can see some photos of the Fellowes Study Stand in use as an iPad stand over at Just Another iPad Blog and see that it looks great in portrait or landscape mode. If you are worried about the coils of wire possibly scratching the back of your iPad you could easily put a piece of felt between your iPad and your Study Stand and you'll have just upgraded yourself to a Premium Study Stand.